💖 Valentine's Day is approaching and it is my very great pleasure to team up with some of my fellow Fashion Flash bloggers for a series of six very special giveaways featuring beautiful and fun prizes including a Sephora gift card, beauty, jewelry and fine fragrance. All perfect indulgences for yourself or that special someone! For my giveaway, I have a beautiful piece of jewelry brought to us by Nancy Davis, founder of Peace & Love Jewelry and the Race to Erase MS. Checkerboard cut, bezel set White Topaz stations are set into an adjustable rhodium plated, 16" sterling silver chain with an extender to custom size this necklace to perfection. Set into the filigreed silver heart shaped basket and prong setting is a 12 x 10 mm faceted pink quartz crystal heart shaped center stone. On the back of the center stone setting is the Peace & Love signature logo. This sweet, delicate necklace is easy to wear, easy to love and it will be the perfect accessory to set off your new spring fashions and enjoy for years to come. Entering this giveaway couldn't be easier! All you have to do is scroll down a little and enter, using the Rafflecopter widget. This giveaway is open from the time this post goes live until 2/20/2017 at 11:59 P.M. M.S.T. When the giveaway ends, a winner will be drawn at random and contacted via the e-mail address provided by the entrant. The winner will have 48 hours from the time I hit send to respond and provide their mailing address or a new winner will be drawn. This giveaway is open internationally, anywhere I can legally mail a package. Entrants must be 18 years or older or the age of majority in your state/country or have the permission of a parent or legal guardian to enter and, if you win, give me your contact information. This prize is a one off. Once the package leaves my hands at the Post Office, I relinquish all responsibility for it. I do my very best to package items so that they arrive intact and in good condition. If the item arrives broken or is lost in shipping, no replacement is offered. All taxes, customs fees or other expenses are the sole responsibility of the winner. No cash substitution will be offered. This giveaway is void where prohibited. All entries must be made in the Rafflecopter widget, below. The more entries you complete, the higher your chance of winning. You can come back and do the Tweet a Message entry every day to rack up even more points and further increase your chance of winning this beautiful prize! My favorite Valentine's Day gift was a box of candy with a doll on top that my father gave me when I was a child. My favorite Valentines Day present was a ruby ring form my husband. My absolute favorite Valentine's day present was when my husband (my then boyfriend) surprised me by flying in to visit me at college and we spent the weekend together. Loved it! On our first Valentines my husband gave me a rain coat, a giant stuffed gorilla and a large tin of chocolates. That was 18 years ago and I still have the coat, gorilla and tin. Dark chocolate is always great for V-day! A shadowbox my Husband put together with some of our old letters and keepsakes. I have a million favorite Vday gifts so I couldn't possible choose but the hat I received for this Vday is right up there. Anything with hearts, like your pretty pink one, wins the day for me. My favourite Valentine's gift was my first pair of diamond earrings my husband gifted me many years ago. My favorite Valentines present was a beautiful bouquet of red roses from my sweet hubby. OH, and those chocolate covered strawberries! Yumm! My husband bought me Amethyst earrings one year & they're still my favorite. A heart hand carved out of marble was the most memorable Valentine's gift. My favorite gift was flowers and a teddy bear. My favorite Valentines gift was a heart-shaped rose arrangement that my husband ordered to be delivered to me while he was in Canada and me in Europe. It was a huge surprise! The first Valentine's Day my husband and I were dating he sent me flowers at work. It was really sweet and let me know he was serious about us. What a gorgeous necklace. I am a heart nut and always wear a heart necklace. I'd be thrilled to wear this. my favourite present was an amber ring from my now husband. The birthstone necklace my husband gave me is my favorite. Ohhh that's so pretty and dainty! My fave was a stuffed animal my now hubs got me on our first Valentine's! My daughter snuggles with it now! My favorite was the Ruby ring my husband gave me! I always love getting sea salt caramel with chocolate for Valentine's Day from my husband. This necklace is so beautiful! My fav gift was a labradorite from the Smithsonian that my husband gave me! My favorite thing I got for Valentine's day was a heart shaped box full of chocolate covered bacon (DONT JUDGE, lol). 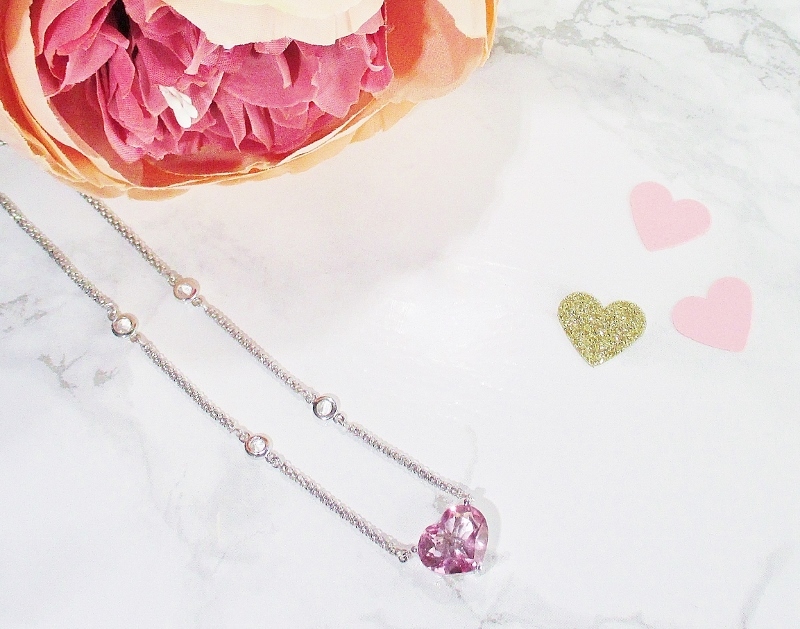 This is lovely and perfect for Valentines Day! A box of brandy-filled cherry cordials. A cedar chest that he built and decorated himself. To answer your question, my favorite Valentine gift was probably last year from the hubby when he made me chocolate covered strawberries. I love them, and the fact he made them himself rather than buying some makes it extra special. How gorgeous!!! So beautiful and a great gift. My favorite Valentine's Day present--oh, that wouldn't be mere, material things. The sun shining--hark! the calling of the birds! These things, these are the things that really matter! That crystal is so pretty! I love large stones on a thin chain. My favorite V-day present were home made cards made by my kids with a poem. This is a gorgeous necklace! Getting to marry the love of my life on Valentine's has been the best gift ever and it was our first Valentine's together. Engagement ring many many years ago. Such an a amazing prize! My favourite Valentine's gift were a little pair of white gold puffed star studs. I dumped the guy, but the earrings are forever. A necklace from my husband. A card from either of my children would make that list as well and that happe4ned maybe twice after they were out of school. Boyfriend and I don't observe Valentine's Day, but the best gift he ever gave me was an arcade machine! It's my favorite video game and it's not a common find. I treasure it. A homemade heart from my daughter from when she was in 1st grade she did her best and spent a lot of time on it I remember her face when she gave it to me! This is such a beautiful necklace! Chocolates and scented candles always work for me! My favorite Valentine's Day gift was a 6 foot tall stuffed animal! One Valentine's Day, my husband surprised me with a kitten! My favorite Valentine's Day present was a trip for the weekend to "Treasure Island"! It was fabulous! My favorite Valentine's Day present was one year we took a road trip and ended up going to see my Aunt. It wa a nice time. A beautiful bracelet from my husband. How very kind of you and your fellow bloggers to give back. 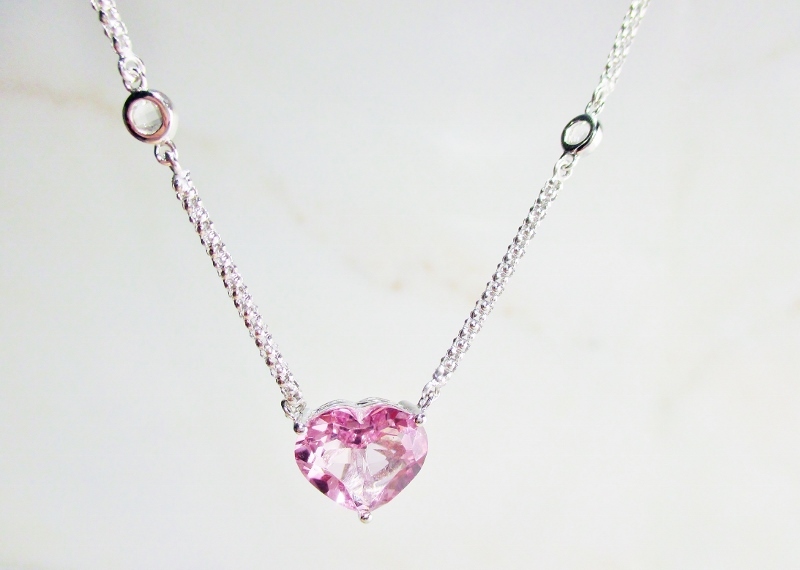 This a lovely necklace, and pink suits everyone! Everyday I spend with my husband is my favorite Valentine's Day! One of my favorite Valentines Day gift was from my best friend. She knows I never have a Valentines Day date. She and I worked together at a huge insurance company when she decorated my desk in all Valentines Day items to make sure I had a special day. No gifts come to mind, but every year my husband finds me a beautiful card and writes his own mushy sentiments. So sweet. What a beautiful Valentine gift! I love hearts & collect them so would love to ad this to my style! My very favorite Valentine's gift was and is my husband's love! My husband gives me red roses for each year we've been married. 36 roses this year! My husband and I don't do Valentine gifts usually but he gave me a beautiful ring with a pink stone one year (completely unexpected)so it would be that. An antique gold with crystals bracelet. My husband always finds the best Valentine's Day card and the messages he writes in them always make me smile. Plus, he gives me Godiva chocolate!!!! I'm a nerd, so getting to try out a really expensive photo editing trackpad this year is the best Valentines ever! When I was a child (soon be sixty) my dad use to give me and my mom each a beautiful decorated heart shape box of candy. Oh, the boxes were so pretty! I was just telling my husband I wished I had kept a few of them. I don't wear heart jewelry but I know a lot of people who would love this! My favorite gift was a beautiful pair of pearl earrings with a matching ring. My kids made me a valentines card when they were little. A carnations flower arrangement that my younger brother got me one year when I was in high school. My feelings were hurt that so many of the other girls were getting flowers at school and I wasn't so he asked my mom to take him to the store and he came back home with them and gave them to me. It was the sweetest thing ever. I actually one of the first valentines gifts my now husband bought me was a printer and a nice dinner out. I know a printer doesn't seem romantic but I had mentioned mine was not working well so it was thoughtful. A beautiful charm necklace. I was so impressed because he took so much care in choosing the perfect charms. My favorite valentines day gift was a trip my fiancé arranged when we were long distance. My favorite Valentine's gift was the beautiful bouquet I received last Valentine's Day. A heart locket from my husband with our pictures in it. A laptop was a great Valentines Day gift who i received. My favorite Valentine's Day gift was wildflowers and a homemade dinner. I don't have a fond or special gift that I have received on Valentine's Day. My husband and I don't really do Valentine's day. Both of believe that one day year should not be the only day that we show the other how much we love each other. We do it all year long. I can't remember my life without him. My favorite Valentine's gift was a day at the spa with my hubby. I love a dinner out with my sweetie. Flowers or chocolates are always welcome! Beautiful necklace! My fave gift was a red heart necklace from my new boyfriend, who is now my husband and father of my child, 17 years later! My most memorable Valentine gift was a glass heart dish from my son when he was in preschool. My favorite valentines day gift was a pair of diamond earrings! A large box of Godiva chocolates with a dozen roses. One of my most memorable gifts from my college boyfriend was a blender and food processor. I love to cook! A Rose and a Pizza! That was memoriable to a tee! Earrings from my Loving Hubby! The promise ring my husband gave me 7 years ago! 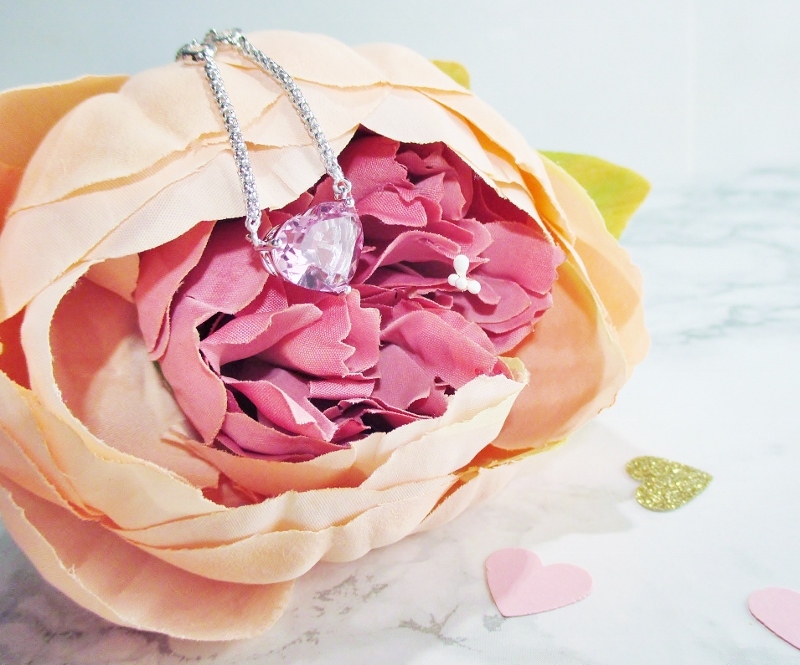 A beautiful bouquet of flowers that I received along with an open heart necklace. Oh I have to say it was a mothers ring! I treasure it!! My favorite Valentine's Day gift was a box of chocolate, which he made for me! My favorite Valentine’s Day gifts were the handmade cards my daughters made for me in school. I still have them. My now husband gave me a beautiful card and a little delicate silk rose when we were dating. That was years ago and the fragile rose hasn't survived all our moves, but my husband and I are still together after all these years. I loved it when my husband took me flying in a rented plane one Valentine's Day. We can't afford to do that anymore! We do not celebrate Valentine's Day but I did receive a card from "I don't know who" umpteen years ago, haha. My favorite Valentine's Day gift was an angel table from my husband. My favorite was a 2 day trip with my husband. My favorite is a heart ring that my husband got me! My son made me an amazing homemade gift this year. It was a picture frame surrounded by small pictures of us together. So sweet! My boyfriend and I went on a trip to Boston this year so that was super fun! The Valentine's Day that stands out to me was when I was in 4th grade I think, I had 5 boys bring me a heart shaped box of candy on Valentine's Day. One box would have made me feel special but 5 made me feel extra special. My Valentine'Day gift I loved the most was the gifts that my grandchildren made me. I❤ my grandchildren so much! I commented and it's not showing up? My favorite Valentine's Day gift was a Giant Chocolate Heart made by a local store. I LOVE chocolate! My favorite Valentine's day present was a personalized photo album filled with precious memories. I received chocolates my favorite. My favorite ever was my special niece born on this day! She is all grown up but still so special to me -- we are going to Europe together in a month! Chocolates are always my favourite valentines gift. We usually cuddle up and share a box while we watch a movie. My husband bought me a beautiful bouquet of flowers with tiny roses and huge lillies! My favorite was a claddagh ring. My favorite Valentines Day present was homemade cards from my grandsons. My favorite was the box of chocolates my father would by me every year. My favourite was a pot of mini-daffodils. It's winter here so long, it was so lovely to get a peek of Spring. I got roses and Godiva Chocolate. Also 2 books.